By Brothers in Food | January 25, 2017 at 12:08p.m. Thank goodness 2016 has disappeared in the rearview mirror. Hard to say whether you can have genuine disdain for a collective period of time, but we are very glad to see the close of those 12 months. Of course, it is hard to say whether it was the events of 2016 or our miserable attitudes that cast such a dreary recollection of the last year. But this year will be different with a New Year and new attitudes. And things are off to a good start. Our first food stop of the year led us to a new restaurant featuring fresh Middle Eastern food and an owner with more energy and enthusiasm than imaginable. K’nafa, located within Madden’s Bar & Grill on Youngstown-Warren Road in Niles, has barely been open 60 days. Its owner, Mohammad Hajjawi, a Chicago native, relocated here a year ago and decided to open his own place after working in the restaurant business most of his life. Hajjawi greeted us with a broad smile and promised that the kitchen was busy preparing us some real food, something with homemade taste. In a few minutes we started our Middle Eastern feast with a variety of his favorite appetizers. First up was the hummus. K’nafa puts a twist on its version by topping it with a mixture of lemon juice, garlic, whole chick peas and sliced jalapeno to give it a little punch. This slight heat provided a nice contrast to the creamy dip. A delicious starter. We moved on to baba ganoush, a roasted eggplant dip mixed with tomatoes, onion, tahini and mint. This had a mild flavor with some smokiness from the roasted eggplant and is a classic staple of a Middle Eastern kitchen. Tabbouleh was sampled next. Chopped parsley, tomato, mint, onion and bulgur wheat mixed with a lemon-olive oil dressing. This dish had the perfect balance of herbs and tartness from the lemon juice. It was bursting with flavor and one of the better versions we have had. One of the most surprising appetizers we tasted was the garlic potato dip, which is a mixture of cooked potatoes, garlic and vegetable oil that is whipped together to an almost light cream consistency. When we first tasted it, we weren’t sure what to make of it. Once we dipped into it a few more times, we couldn’t stop eating it. It had a very mild flavor but it was the light texture that had us hooked. We finished off our appetizers with falafel and fried kibbeh. Falafel is essentially a fried chickpea fritter. These were slightly crispy with a moist center. The kibbeh was made up of ground beef, slivered almonds, garlic, onions and spices, which is then fried until crisp. The flavorful garlic sauce was the perfect accompaniment. All the starters were served with a basket of pita bread. We loved all the appetizers, as the table of empty plates demonstrated, but it was time to move on to the entrees. We first tried two of K’nafa’s signature entrees. The mixed kabob dinner and the mixed seafood grill. The kabob dinner consists of a choice of three meats served with rice and grilled vegetables. We sampled a lamb, chicken and Kufta kabob. All the meats are marinated overnight then grilled over a wood fire. This gives the meats a nice smoky flavor. The lamb and chicken were tender, juicy and flavorful with a nice outside char. The kofta kabob was a mixture of 90 percent ground lamb and 10 percent ground beef. It was perfectly spiced with a nice char as well. This dinner gives you the opportunity to try a variety of meats and we would highly recommend it. The mixed seafood grill contains portions of grilled salmon, grilled shrimp and a tilapia filet coated in lemon, garlic and flour. Everything was cooked nicely with mild seasoning that didn’t overpower the fish. Both dinners were served with either a yellow or red rice. The rice is similar to a pilaf with the yellow rice having a mild flavor. The red rice is seasoned with biryani spice, thus making it a little spicy. 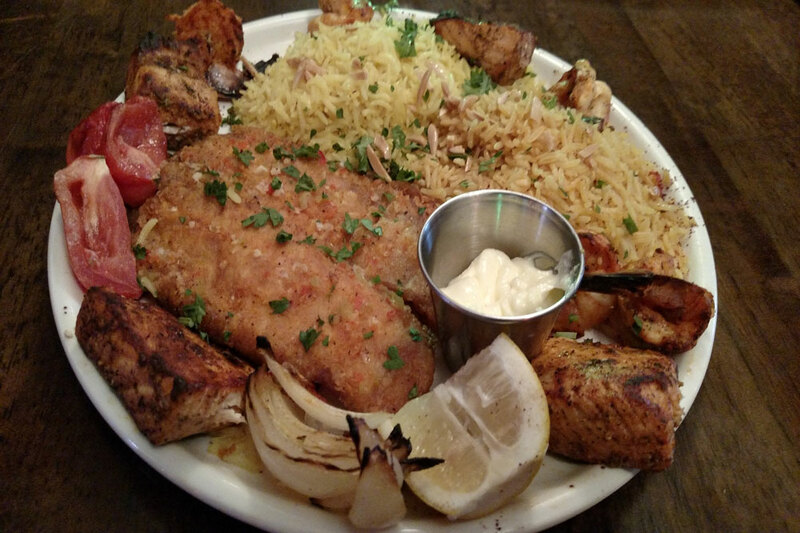 We completed our sampling of entrees by trying a wonderful whole red snapper as well as chicken and beef shawarma. Mark, like a skilled surgeon, lifted portions of the snapper away from bones. The skin was crisp and the flesh was succulent. The beef shawarma is an Arabic version of the gyro. Marinated and layered with spices, the meat is then cooked and sliced off a vertical grill then wrapped in a pita with onion and tomato. Both were just delicious. The final offering was one of the main reasons we chose the restaurant as well as where the restaurant gets its name. K’nafa is a classic Middle Eastern cheese pastry that we have read about and seen on television but have never actually eaten. Hajjawi takes pastry dough and tops it with an imported Turkish cheese, a simple syrup and crumbled pistachios. It has the consistency of a Danish but is not nearly as sweet. He cooks it over the wood fire so it’s served hot with the cheese melted. When you visit the restaurant, be sure to try this dish.